Taking its name from the temple up on the cliff, the Pura Dhang Kahyangan Gunung Payung, this beach isn’t the easiest to access, but is definitely worth getting to. Approach the cliffs past the temple and look for a long flight of steps that lead down - about 300 of them - and remember that you’ll have to climb all those steps back up. The remote location and the difficult access keep both the normal number of tourists and vendors away, creating a Hidden Gem. There are usually very few people here. The reefs out in the water create a natural wave break, which means these crystal clear waters are relatively calm. There is a small cave here too. Obviously, this is not a good beach for watersports. Come by taxi, bemo or ojek. How popular is Gunung Payung Beach? People normally club together Mengiat Beach and Nyaman Gallery while planning their visit to Gunung Payung Beach. 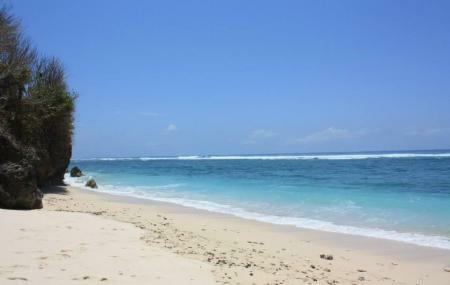 This is my favorite beach in Bali. The view was stunning and normally it’s less people because it’s not easy to go here. We need to go downstairs ( a couple of hundreds) to be on this beautiful beach. And if you’re hungry then you’ll find a lot of food stall upstairs. Do YOU need a beach where there's not many people around? Then this is the beach for you. But i dont recommend swimming in the beach cause it's make my skin red and itchy. On the other hand, You need to walk down the stairs for at least 10 minutes to get to the beach, but along the way there are some beautiful views that you can see. The beach is not too crowded so it is still clean and the scenery is very beautiful. There is a cave that not to deep.For the beach we need to go down a few hundred stairs but that will all be paid off with the scenery there and the sea water still clear.